Dr. Stephen M. Kirby and Robert Gorter, MD, PhD. And numerous Muslim scholars have also reported these ages of six and nine in many authoritative works over the centuries. Consequently, there are many Muslims today who do acknowledge these ages, but they rationalize it by claiming that since people on the Arabian Peninsula in the 7th Century did not live as long as we do today, things like marriage had to be done at much earlier ages. Is this true? Muhammad’s fifth wife, Zaynab bint Khuzaimah, was the exception among Muhammad’s wives in terms of age at death. Leaving Zaynab out of the equation, we find that Muhammad’s other wives died when they were between 51 and 84 years old; the average age of death was 67.7 years. Aisha herself lived to be 66. These are the first four Muslim leaders after Muhammad died. They were called “Rightly Guided” because they are believed to have held the most firmly to the teachings and example of Muhammad. Muhammad died at age 62. We can see that three of his four successors also lived into their early sixties, with the fourth even reaching the age of 80 before he was assassinated. As we can see, these Muslims lived to between 60 and 87 years of age. What immediately jumps to mind is the fact that those listed above actually lived life spans that are pretty common in our time. In terms of Muhammad’s eleven wives, with the exception of one, their average age of death was 67.7 years. And Aisha herself lived to be 66. 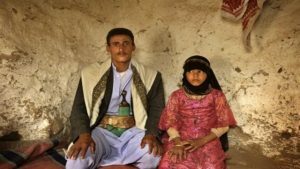 These facts refute the claim that the only reason Muhammad married a six year old child and consummated their marriage when the child was nine was because folks didn’t live as long back then. 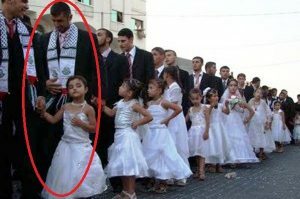 The reality is that Muhammad married a child and consummated that marriage with the child simply because he wanted to and he could. Muhammad bin Ismail bin Al-Mughirah al-Bukhari, Sahih Al-Bukhari, trans. Muhammad Muhsin Khan (Riyadh, Kingdom of Saudi Arabia: Darussalam, 1997), Vol. 7, Book 67, No. 5133, p. 57. Abu Ja’far Muhammad b. Jarir al-Tabari, The History of al-Tabari: The Last Years of the Prophet, Vol. IX, trans. and annotated Ismail K. Poonawala (Albany, New York: State University of New York Press, 1990), pp. 130-131. Sahih Al-Bukhari, Vol. 5, Book 63, No. 3894, pp. 139-140; Safiur-Rahman al-Mubarakpuri, The Sealed Nectar (Riyadh, Kingdom of Saudi Arabia: Darussalam, 2008), pp. 176-177, and 562; Safiur Rahman Mubarakpuri, When the Moon Split (Riyadh, Kingdom of Saudi Arabia: Darussalam, 2009), p. 129; Abu’l Hussain ‘Asakir-ud-Din Muslim bin Hajjaj al-Qushayri al-Naisaburi, Sahih Muslim, trans. ‘Abdul Hamid Siddiqi (New Delhi, India: Adam Publishers and Distributors, 2008), Vol. 4, Nos. 1422, 1422R1 and 1422R3, pp. 353-355; Muhammad bin Yazeed ibn Majah al-Qazwini, Sunan Ibn Majah, trans. Nasiruddin al-Khattab (Riyadh, Kingdom of Saudi Arabia: Darussalam, 2007), Vol. 3, No. 1876, p. 76; Abu Dawud Sulaiman bin al-Ash’ath bin Ishaq, Sunan Abu Dawud, trans. Yaser Qadhi (Riyadh, Kingdom of Saudi Arabia: Darussalam, 2008), Vol. 2, No. 2121, p. 540; and Vol. 5, No. 4933, p. 327; Abu ‘Abdur-Rahman Ahmad bin Shu’aib bin ‘Ali bin Sinan bin Bahr An-Nasa’i, Sunan An-Nasa’i, trans. Nasiruddin al-Khattab (Riyadh, Kingdom of Saudi Arabia: Darussalam, 2007), Vol. 4, No. 3257, p. 118, and Nos. 3380-3381, pp. 181-182; Abu Ja’far Muhammad b. Jarir al-Tabari, The History of al-Tabari: The Foundation of the Community, Vol. VII, trans. and annotated W. Montgomery Watt and M. V. McDonald (Albany, New York: State University of New York Press, 1987), pp. 6-7; and The Honourable Wives of the Prophet, ed. Abdul Ahad (Riyadh, Kingdom of Saudi Arabia: Darussalam, 2004), p. 42. Brief Biography of Ist Ummul-Mumineen Syeda Tahera Khadijatul-Kubra Bint Khuwailid (RA) http://www.quransearchonline.com/Home/Biography.asp. Brief Biography of IInd-Ummul-Mumineen Umme-Saudah Bint Zama (RA) –http://www.quransearchonline.com/HTML/Biography/ilyref/saudaraz.html. Brief Biography of IIIrd-Ummul-Mumineen A’isha Siddiqa (RA) Bint Abu Bakr Siddiq (RA) – http://www.quransearchonline.com/Home/Biography.asp. Brief Biography of IVth-Ummul-Mumineen Sayeda Hafsa (RA) Bint Umer Farooq (RA) – http://www.quransearchonline.com/Home/Biography.asp. Brief Biography of Vth-Ummul-Mumineen Zainab Bint Khuzaimah (Ummul-Masakeen) (RA) – http://www.quransearchonline.com/Home/Biography.asp. Brief Biography of VIth-Ummul-Mumineen Umm-e-Salma Bint Abe Umayya (RA) – http://www.quransearchonline.com/Home/Biography.asp. Brief Biography of VIIth-Ummul-Mumineen Zainab Bint Jahash (RA) – http://www.quransearchonline.com/Home/Biography.asp. Brief Biography of VIIIth-Ummul-Mumineen Juwairiyah Bint Harith (RA) – http://www.quransearchonline.com/Home/Biography.asp. Brief Biography of IXth-Ummul-Mumineen Safiyah Bint Huyaiy (RA) – http://www.quransearchonline.com/Home/Biography.asp. Brief Biography of Xth-Ummul-Mumineen Umm-e-Habeebah (RA) Bint Abi Sufyan (RA) – http://www.quransearchonline.com/Home/Biography.asp. Brief Biography of XIth-Ummul-Mumineen Maimunah Bint Harith Al-Hilalia (RA) – http://www.quransearchonline.com/Home/Biography.asp. This and the following section are based on: 1) Muhammad ibn ‘Abdul Wahhab at-Tamimi, Abridged Biography of Prophet Muhammad, ed. ‘Abdur-Rahman bin Nasir Al-Barrak, ‘Abdul ‘Azeez bin ‘Abdullah Ar-Rajihi, and Muhammad Al-‘Ali Al-Barrak (Riyadh, Kingdom of Saudi Arabia: Darussalam, 2003); 2) Sa’d Yusuf Abu ‘Aziz, Men and Women Around the Messenger, trans. Suleman Fulani (Riyadh, Kingdom of Saudi Arabia: Darussalam, 2009); and 3) HistoryMuslim, http://allabouthistorymuslim.blogspot.com/.